Picture this scenario if you will: There are only three people left in the whole world, a man and two women. But the man has a low sperm count and the women—who are, respectively, his daughter and granddaughter—are infertile. That wouldn’t bode well for the human race, would it? Yet that is exactly the situation facing the Northern White Rhino, a species that is down to exactly three members (a male, Sudan, and two females, Najin and Fatu) thanks to decades of poachers hunting the animals for the supposed medicinal value their horns. 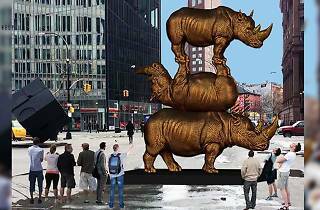 Now, the husband-and-wife artistic duo who go by Gillie and Marc are in the process of raising money to erect a monumental sculpture of the animals at Astor Place in January, across from the famous Astor Place Cube (which was returned to its spot in 2016 after a two-year hiatus while Astor Place was receiving a major facelift). The total cost of the piece is $200K of which Gillie and Marc will pony up $150,000; they've begun a Kickstarter campaign to raise the remaining 50,000. The sculpture depicts Sudan, Najin and Fatu stacked on top of each other like circus acrobats. 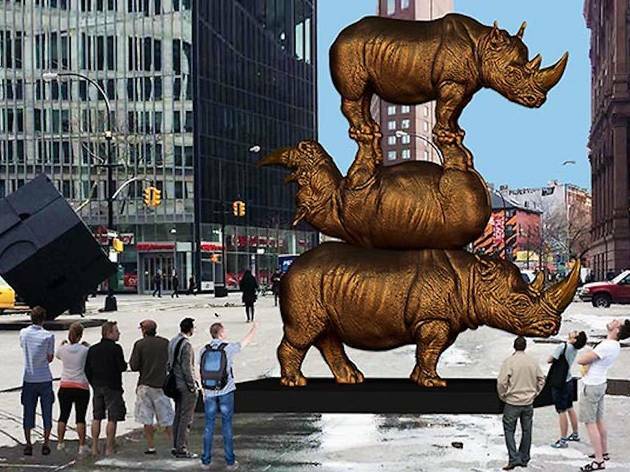 Gillie and Marc describe the piece as a way to bid the trio a fond farewell, but it’s also meant to raise awareness of the dangers facing the other Rhino species spread across African and Asia, including the Southern White Rhino, which is faring only somewhat better than their Northern cousins (two of them live at the Bronx Zoo). After New York, Gillie and Marc plan a ten-city global tour for the work. If you want to contribute to the project, you can click at the link here.